The family of murdered schoolgirl Alice Gross have called for tougher controls to stop foreign criminals entering the UK. The family of murdered schoolgirl Alice Gross say they do not want her death to be 'hijacked' by anti-immigration groups. 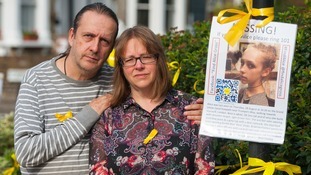 Alice's parents Jose Gross and Rosalind Hodgkiss say they need to know what the authorities knew about convicted killer Arnis Zalkalns, and hope an inquest will look at the wider circumstances surrounding her death. Although we now have certain information about how Alice died, we are still left with a number of serious unanswered questions about what the authorities knew or should have known about the man who is believed to have killed our daughter when he came to the UK. Alice believed in the free movement of people and so do we. For her sake we are determined to ask these questions responsibly and sensitively. The family has asked civil rights group Liberty to represent them at her inquest. Emma Norton, a legal officer from the organisation said 'The family is aware that this is a sensitive and difficult subject, and is concerned to ensure that it is not hijacked by groups with an anti-immigration agenda. Metropolitan police have released an interactive map explaining how they built their evidence into the investigation of the death of 14-year-old Alice Gross. The map shows the last known sighting of Alice on August 28 last year, and the moment police belief she came into contact with convicted murderer Arnis Zalkans. Police have released pictures of the shoes Alice Gross was carrying in her rucksack when she died. Traces of Zalkalns' DNA found on Alice's shoes. Credit: Met Police. In a statement today, police said that though they have no eyewitness evidence that Arnis Zalkalns killed Alice, they have pieced together circumstantial DNA and other evidence that would have been enough to charge him with her murder. Traces of Zalkans' DNA were found on the back of the shoes. Tim Thompson, Deputy Chief Crown Prosecutor for CPS London said he had not been asked to consider any other suspect. The rucksack Alice was wearing when she was killed. Credit: Met Police. The evidence as a whole gives rise to a circumstantial case that would clearly meet the full Code test. Of all the people the various strands of evidence might have implicated they in fact point towards Arnis Zalkalns: a person who has previously killed, and concealed the body of, a young woman. I would therefore have authorised the police to charge Arnis Zalkalns with murder if he had been alive at the time of the report. The cover of Alice's iPhone case was found concealed in the garden of Zalkalns house. Credit: Met Police. Police say significant DNA evidence links Arnis Zalkalns to the murder of Alice Gross and that investigators established enough to charge him, had he been alive. Among the evidence was an iPhone cover found concealed in his garden. The iPhone case found buried in the garden. Credit: Met Police. Police said it was not possible to positively identify it by a reference to a serial number as it does not have one, but Alice's sister is confident it is hers. The iPhone case as found in a narrow void in the read of the garden. Credit: Met Police. The cause of Alice's death was "compressive asphyxia", police said. Zalkalns was found hanged in October last year, and police said they are not looking for anyone else in connection with the death. Police investigating the murder of schoolgirl Alice Gross said Arnis Zalkans, the man they say they would have charged, went back to the crime scene on three separate occasions after her death. ITV News reporter Sejal Karia is at Scotland Yard. Police: Zalkans went back to crime scene on 3 separate occasions. He was caught on CCTV. Off believe to conceal body. Police believe #AliceGross was killed shortly after Zalkans came across her on 28th AUG 2014, the day she disappeared. The Metropolitan police said they believe they had enough DNA evidence to charge convicted killer Arnis Zalkalns with the murder of schoolgirl Alice Gross, had be still been alive today. Detective Chief Inspector Andy Chalmers said his "most likely motive was sexual". Zalkans was found dead in Boston Manor Park in west London on October 4 last year, following an international man-hunt. He had been identified by police as their chief suspect. ITV News reporter Sejal Karia is at the police briefing. The Metropolitan Police said they believe they would have had enough evidence to charge Arnis Zalkans with the murder of 14-year-old school girl Alice Gross. Arnis Zalkans, the convicted killer who was found dead in October 4 last year following an international man hunt. Credit: Police handout. Police said they found an iPhone cover belonging to murdered schoolgirl Alice Gross inside the garden of Arnis Zalkans, the main suspect in the case. Police: #AliceGross iPhone cover found in main suspect Arnis Zalkans garden..it was "concealed"
The inquest into the death of a suspect in the murder of schoolgirl Alice Gross has been adjourned, Scotland Yard said. An inquest into the death of convicted killer Arnis Zalkans - whose body was found in Boston Monor Park, west London on October 4 - was due to resume today. But police said it had been adjourned until the conclusion of the 14-year-old's inquest. The Latvian national's body was discovered just four days after Alice's body was discovered in the Grand Union Canal. The teenager went missing from her home in Hanwell, west London on August 28, sparking a huge search operation.